Bright, bold yellow with an orange speckled heart, Richard Wallace Cannas are a manageable, medium height, with traditional green foliage. They grow in nearly any soil and multiply themselves in a blink of an eye. 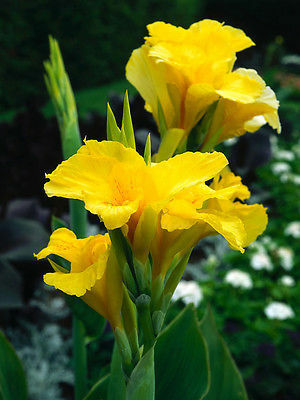 Canna lilies are big and bold, with leaves that fall into the "large" to "huge" range and flowers that follow suit. Overwintering should begin after the first autumn frost has blackened the foliage or the foliage begins to wither. Cut stems back to 10 to 15 centimetres. Gently dig up each clump of roots, turn them over and allow them to dry for a few hours. Soil left on the rhizomes will help to keep them from drying out. Store clumps in barely moist, sterile sand, peat moss, or vermiculite in a cool, dark location. Ideally, place them on shelves or racks, or hang them in mesh bags so that air can circulate around the rhizomes. Don't let the planting mix freeze or dry out during storage. The medium should remain moist but not wet, or the rhizomes will rot. Shipping and Handling Discount - Regular shipping price for first purchase of seeds, additional $1.00 for each seed purchase there after. Please do not make payment until you receive an invoice with shipping discount applied.